Kiwame 5.5″ Rose Gold Hair Scissors VG-10 Super Steel Cobalt Shears. This is the Kiwame 5.5″ Rose Gold Hair Scissors VG-10 Super Steel Cobalt hair cutting shears with the ergonomically comfortable offset grip, featuring the ultra sharp slide cutting convex edge made from the highest Quality Authentic Japanese VG-10 Super Stainless Steel & Cobalt Alloy (Rockwell Hardness of 62+). VG-10 (also known as V Gold 10 “gold” meaning quality) is a unique formulation of steel with a high carbon content, and containing the following: Chromium, Vanadium, Molybdenum and Cobalt. The steel is specially designed for high-quality and coated with our beautiful and popular Rose Gold Titanium. 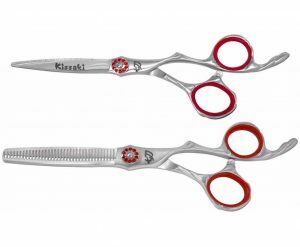 This Kiwame 5.5″ Rose Gold Hair Scissors VG-10 Super Steel Cobalt Shears is a Premium Hair Cutting Shears for the Professional Hairdresser who will only accept the best.